Good Thurday to you. We've got the News and Notes you need plus a bunch of new content for you. 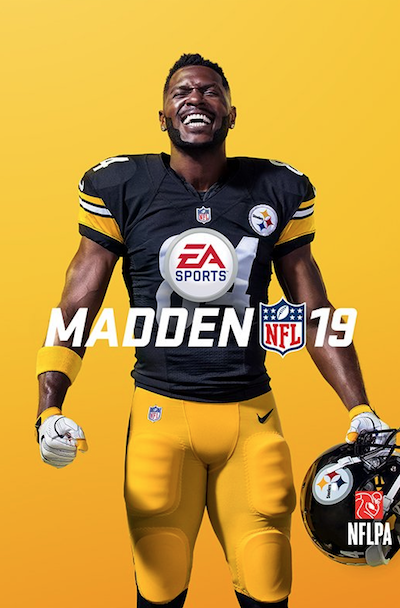 And just for fun, the new Madden cover is out featuring Antonio Brown. Which always makes me ask the question - How much do you believe in the Madden Jinx? Hit me up and let me know. More from our Dr. Drinen's Stats Lab. This is called the Player Pair Scatterplot Generator - pick a player, then another, then a range of years. This tool will give you an annotated scatter plot of their fantasy points by week. Check it out. Our Top 300 is just that. Our David Dodds with an updated list of the Top 300 Players. Our Top 300 is just that. Our David Dodds with an updated list of the Top 300 Players. This one is for Point Per Reception (PPR) Scoring. Our Draft List is much more a the list we'd actually draft from. We take our Top 300 and factor it against Average Draft Position (ADP) to create a realistic Draft List. Our Draft List is much more a the list we'd actually draft from. We take our Top 300 and factor it against Average Draft Position (ADP) to create a realistic Draft List. This one is for Point Per Reception (PPR) scoring. Our Draft Dominator Classic is the standby Drafting Tool we've had for years. The Windows Version is updated with the latest projections and ready for you here. Our Draft Dominator Classic is the standby Drafting Tool we've had for years. The Mac Version is updated with the latest projections and ready for you here. For you old school Excel fans, the Value Based Drafting (VBD) Excel App is ready for you here. J. FREE Feature - What's Going to Happen in the Houston Backfield? K. What's Going to Happen in the Indianapolis Backfield? When Frank Gore left, the road seemed clear for Marlon Mack to have a big role in Indianapolis. Then, the Colts grabbed Nyheim Hines and Jordan Wilkins in the draft. Hines, in particular, has garnered a good amount of nice press during offseason workouts. Will the rookies be more than complementary pieces to Mack? Does Robert Turbin get anything significant when he returns from suspension? L. What's Going to Happen in the Miami Backfield? Kenyan Drake was excellent down the stretch in 2017 after Jay Ajayi was shipped to Philadelphia. But the Dolphins brought in veteran Frank Gore and rookie Kalen Ballage. Does Gore have anything left? Is Ballage ready to have a notable role? Will Drake actually be one of those rare workhorse backs? M. What's Going to Happen in the New England Backfield? 1. GB - RB Aaron Jones to emerge as starter? Green Bay Packers RB Aaron Jones will end up as the team's starting running back this season in the opinion of USA Today Network Wisconsin's Stu Courtney. Fantasy GMs are cautious when it comes to projecting the starter for the Packers in 2018. Jamaal Williams has the highest ADP of their group (RB36, 7.11) but Jones is close behind him at RB41 (9.01) in 12-team PPR leagues. Behind those two is Ty Montgomery, sitting at RB43 (9.07) as of right now. We'll see this battle shake out during training camp with each back bringing a unique skill set to the competition. Williams is the banger while Montgomery is the better receiver. Jones is arguably the best all-purpose back of the group. Stay tuned. Baltimore Ravens QB Joe Flacco 'got a lot of good work in' with his wide receivers last week, according to WR Willie Snead. Flacco will have a brand new WR corps to throw to in 2018. The team went out in free agency to add Snead, Michael Crabtree and John Brown. It seems to be a make-or-break year for Flacco in 2018 with rookie first-round pick Lamar Jackson developing behind him this year. We'll see if Flacco can establish strong chemistry with his new receiving weapons and lead the Ravens back to the playoffs this year. Arizona Cardinals TE Ricky Seals-Jones was reportedly arrested over the weekend for assault, disorderly conduct and criminal trespassing. Seals-Jones allegedly sought to use a hotel restroom but was denied entry because he was not a guest. Seals-Jones then reportedly tried to use the restroom inside one of the hotel's restaurants and once he was denied entry again, he is accused of shoving an employee to get by him. Buffalo Bills QB Josh Allen is slated to start with the third-team offense when the club begins training camp Thursday, July 26. That's 'the plan as of now, per head coach Sean McDermott,' while QBs AJ McCarron and Nathan Peterman both play with the first-team offense. That's to be expected, not only because Allen is a rookie but because he primarily ran the third-team offense during OTAs and minicamp. Allen is the quarterback of the future, but if he wins the job for Week 1 of the regular season he's not going to be working with a great group of WRs...and the offensive line has been rebuilt...and who in the world knows what's going on in the LeSean McCoy situation. As you can see, we don't like Allen in redraft leagues but still appreciate his skill set in dynasty formats. Free-agent FS Lardarius Webb (Ravens) wants to continue his NFL career and has received multiple offers that he is considering. There hasn't been much news on Webb since the Ravens released him back in March. He could continue playing, but he won't see as many snaps as he used to be when he was an outside corner. Webb has length and finds his way around the ball, so some team might want him as veteran depth in 2018. New Orleans Saints RB Daniel Lasco was released Wednesday, July 18, in the wake of the signing of RB Shane Vereen. Lasco was a do-everything back in college at Cal but he never did much to impress with the Saints. The addition of Vereen meant there was no room for Lasco with training camp coming up. We could see a team show interest in Lasco but likely just for a camp body. Free-agent RB Shane Vereen (Giants) signed an undisclosed deal with the New Orleans Saints Wednesday, July 18. Vereen is a pass-catching back who gives the Saints (more) veteran depth on their roster. Their RB room is jam packed with talent, so Vereen is no lock for the 53-man roster. Alvin Kamara leads the way with Mark Ingram as a top reserve (when he's back from his four-game suspension). Behind Kamara, Vereen will compete with guys like Terrance West and Jonathan Williams to establish a pecking order. Free-agent CB Darrelle Revis (Chiefs) announced his retirement from the NFL Wednesday, July 18. We'll likely see Revis in the Pro Football Hall of Fame someday. Revis was a first-round pick of the Jets back in 2007 and he was the definition of a 'shutdown' corner. He defined the position so much that his spot on the field became known as 'Revis Island' and opposing quarterbacks didn't challenge him much. Revis won Super Bowl 49 with the Patriots and should wind up being honored by the Jets in their Ring of Fame after two stints with the team. New England Patriots WR Jordan Matthews is considered a lock to make the team, according to beat writer Mike Reiss. Anytime Reiss is hyping a player the way he's doing with Matthews (remember his Wes Welker information years ago?) we always pay close attention. Matthews looked good during OTAs and minicamp this spring, and the Patriots should use him early and often while Julian Edelman is serving his four-game suspension to begin the regular season. Matthews makes for a perfect addition late in your draft. His current ADP is WR59 (13.10) in 12-team PPR leagues. New England Patriots WR Malcolm Mitchell, Kenny Britt and Phillip Dorsett are on the bubble to make the team, according to beat writer Mike Reiss. Mitchell is on the bubble because he just can't stay healthy. A fourth-round pick out of Georgia in 2016, Mitchell missed all of the 2017 season due to a knee injury. Even though he's over a year removed from the injury, his status for the start of training camp is unknown. Dorsett is a speed guy who hasn't done much to impress with the Colts or the Patriots. Britt had a 1,000 yard season back in 2016 (with the Rams) but he had a bad 2017, getting picked up by the Patriots near the end of the year and Britt was a healthy scratch for Super Bowl 52.